BleachSafe towels by Blusand Beauty are the only towels to use premium BleachSafe technology, which renders towels completely safe from bleach spots so you can remove stains without ruining the towel! Our formula is integrated into each fiber, won't wash away after a few dozen uses and doesn't affect the towel absorbency. No one enjoys itchy or scratchy towels, especially when using them on your hands, face or neck. That's why we formulated our towels with 100 percent pure cotton for an ultra soft feel that you will love. And, the cotton material ensures superior thickness and absorbency, so you can feel instantly comfortable and dry. We designed our towels to be long lasting and durable to the elements whether you're using it to scrub counters, keep a client's neck clear from hair dye or to wipe sweat off your brow. We double stitch our towels to prevent fraying and you can safely use chlorine bleach on tough spots while maintaining the same vibrant color overtime. BleachSafe towels can be used over and over for a variety of purposes. Our 15 inch x 26 inch towels are the ideal hand, face, neck or dish cloth to use at a spa or salon, in the gym or at a restaurant or coffee shop. Wipe up stains, clean up hair color, scrub off tough grease, swipe away sweat or use as part of a soothing spa treatment. Wash towels in hot water or bleach following the instructions on the bottle. 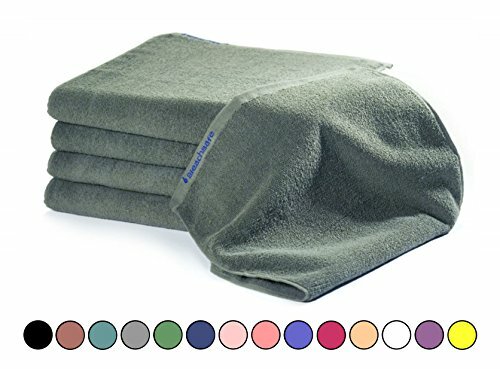 We created our towels with quality and simplicity in mind, providing you with 9 vibrant, unique colors to match your business or brand aesthetic. Our lightweight, extra durable towels come in a pack of 24 so you will always have enough on hand. If you have any questions about this product by BLEACHSAFE, contact us by completing and submitting the form below. If you are looking for a specif part number, please include it with your message.